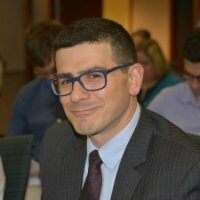 Benjamin Cerf is an economist in the Center for Economic Studies at the U.S. Census Bureau and is also the Administrator of the Northwest Federal Statistical Research Data Center at the University of Washington. His research uses linked administrative and survey data and other big data techniques to investigate experiences of marginalized populations. In particular, Ben’s work focuses on participation in anti-poverty programs like the Supplemental Nutrition Assistance Program (SNAP); the demographics and labor market experiences of LGBT individuals; and the training and labor market experiences of women and foreign born students in Science, Technology, Engineering, and Mathematics (STEM). Ben earned his PhD in economics from Simon Fraser University in 2013. He also holds an MA in economics, as well as BAs in Philosophy and Classics, all from the University of Montana. For more on Ben’s work, see his Reasearcher Profile at the Census Bureau.